Fallingwater. 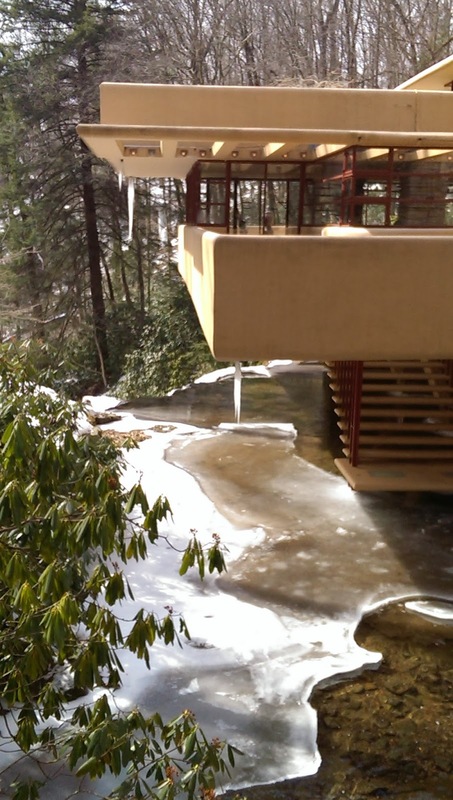 The Kaufman family asked Frank Lloyd Wright for a cabin in the woods. The budget was $30,000. Wright got the woods part right. Everything else he got perfect. When you were in elementary school you may have made a shadow box. Imagine that you are in such a box. The shape is like a pizza box with a very low ceiling. You are glued standing way in the back. You feel protected, but not claustrophobic. 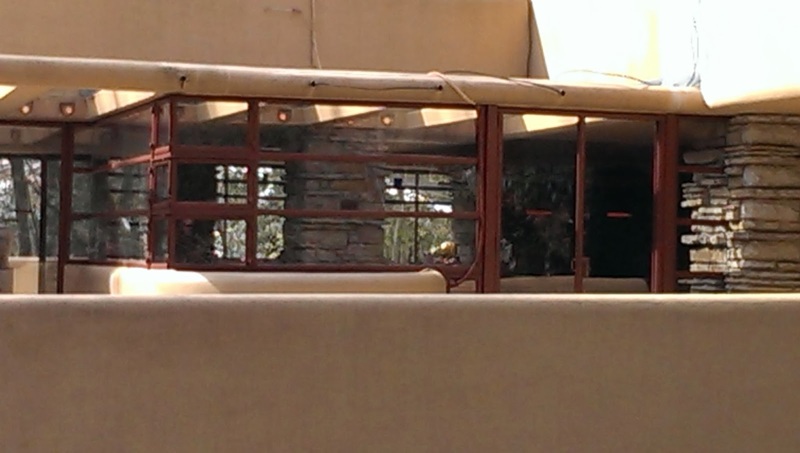 There are continuous windows across the front and halfway back on either side. You stand there in awe, a silly grin has been drawn on your face. For up wells a feeling of being a child in a magical place with a stone floor, high up in the trees and splashed by the sound of falling water. Pinch your side, give yourself a wrinkle. This place exists. Three boxes each smaller stacked make a house for three. The top box is for the son, who never ever really leaves and becomes an architect himself studying under Wright. He is the one who gifts the house to us. Above the house and the drive is a guest house and to the side a multi-stalled carport. Rooms above for the servants and the cook are as stylish as the family house. When the cook (who turned 100 this year) was asked on a scale of 1 to10 to rate working for the family, she gave them an 11! Maintaining this home is a challenge. The cantilevered balconies would be enough, but the stream has flooded the first floor having climbed the stairs you see here. 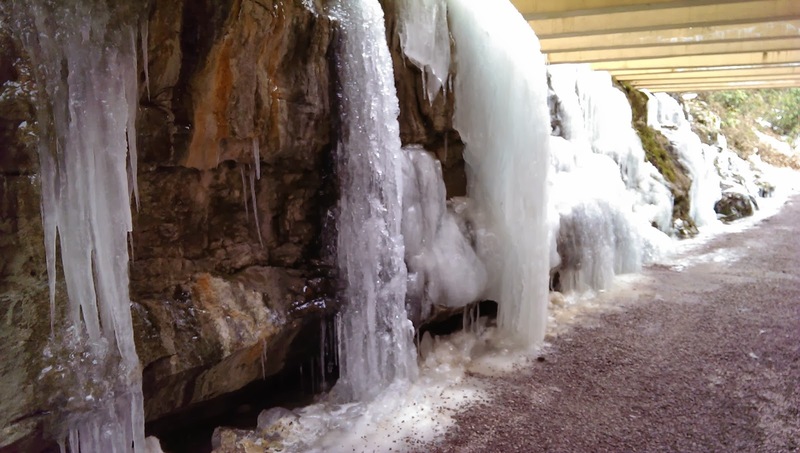 The first day of March was Fallingwater's opening for the season. This was a tough winter. 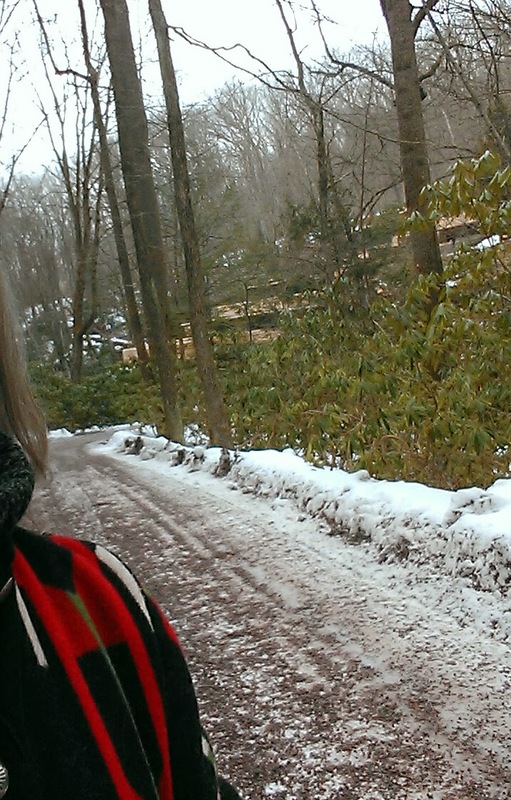 This view down the drive between the uphill guest house and the main house is a chilling one. One may not take photos inside, which is just as well, because hopefully you will visit one day and see it for yourself. As I walked back along the path in my fancy houser coat (this is like saying a ball gown) to the long ramp up to the visitors pavilion, I became aware of a large crowd of people ahead waiting apparently for me. 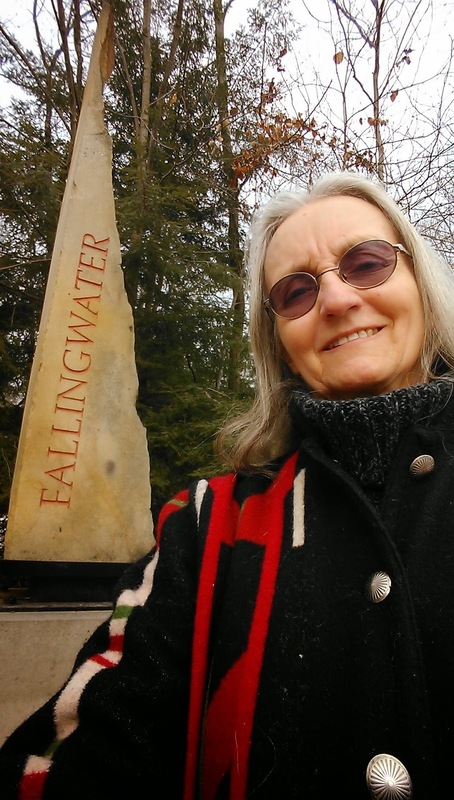 As I got closer I realized that my coat with it's Frank Lloyd Wright-like design had fooled them into thinking that I was their Fallingwater guide! Now that was a compliment for a houser. 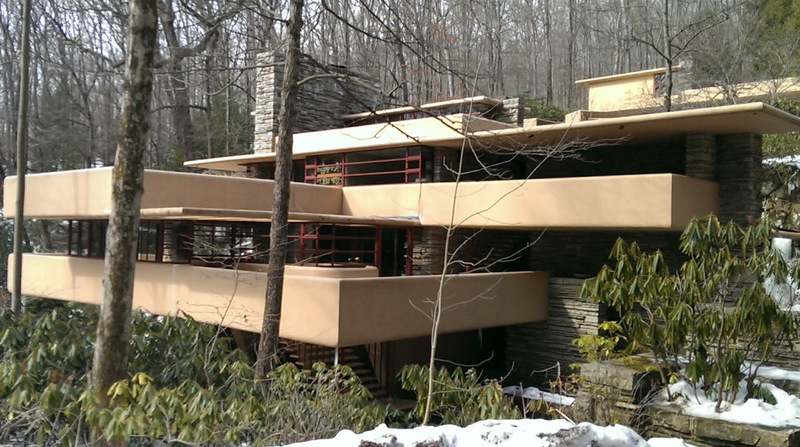 Fallingwater came in a little over budget at $150,000. Looks pretty good for $30,000 I've got to say! Ha, the actual budget came in at over $150,000. The owner complained to Frank Lloyd Wright that the built-in desk in the office was too small. Wright did not want to change it, but did so when the owner said that the desk was "too small to write the builder a check on". I'm rather sure I'll be informed many new stuff right right here! Thank you for comments. Hope you get to Fallingwater! Your paragliding looks like a blast! helped me out a lot. I'm hoping to provide something back and aid others such as you aided me.